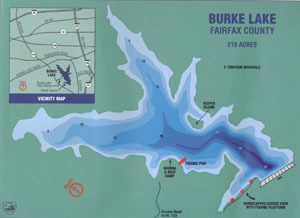 Burke Lake is a 218-acre Department-owned public fishing lake in Fairfax County. The lake serves as the main attraction to Burke Lake Park, a 650-acre park operated by the Fairfax County Park Authority. Burke Lake offers excellent fishing and features largemouth bass, muskellunge, walleye, channel catfish, bluegill and black crappie. Anglers may also catch white perch, yellow perch, redear sunfish and an occasional blue catfish. Due to its proximity to Washington, D.C., Burke Lake is one of the most heavily fished reservoirs in Virginia. The intense fishing pressure on Burke Lake has led fisheries biologists to intensively manage the resource. The lake is fertilized annually to stimulate the aquatic food chain. The added nutrients increase the lake’s productivity and overall fish production but are used within the system without adding to nutrient loads downstream. Fish attractors have been placed around the lake to offer additional habitat. The lake is stocked annually with walleye, muskellunge and channel catfish. Burke Lake is sampled on a regular basis through electrofishing and trap netting so biologists can get an accurate picture on the state of the fishery. Since District rankings have been conducted (10 years), Burke has been one of the top NOVA District waters for catch rate of large bass. All lake users are reminded that Burke Lake is a State-owned Public Fishing Lake and not a county park. Access at the DGIF road off Route 123 on the south (dam) end is exclusively for angler use. All other uses constitute trespass and will be prosecuted. Kayaks, unless used for fishing, are prohibited in Burke Lake from either access. The largemouth bass population of Burke Lake is in excellent condition with bass averaging around 3 pounds and 6 pound bass common. In the spring 2010 electrofishing sample, fisheries biologists collected 143 largemouth bass per hour of sampling. The bass looked to be in great shape with the size structure of the population evenly distributed from 12 to 22 inches. The data revealed the CPE-P to be 42. CPE-P is the index used in analyzing sample catch rates. It stands for the “catch per effort of preferred fish.” The CPE-P for LMB is the number of bass 15 inches or larger that are collected in one hour of electrofishing. Based on CPE-P, Burke Lake is ranked fourth out of 20 popular northern Virginia impoundments sampled by VDGIF biologists during the years 2005-2012. Due to the combination of fishing pressure and abundant forage, largemouth bass are difficult to catch at Burke Lake as bass feed heavily upon schools of gizzard shad. Anglers should concentrate their efforts along the willow weed beds that line the banks of the cove across from the park boat ramp. Anglers are encouraged to try different techniques not normally used by average fishermen. The use of a different lure or retrieve may turn out to be what the bass are looking for. A good fish finder will allow you to find schools of shad and the bass feeding on them. Anglers should try a variety of shad/bait fish imitating lures such as crank baits (lip-less and diving) and soft plastic jerk baits as well. Burke Lake provides a trophy muskie fishery with numerous fish in the 20-25-pound range. Muskie were initially stocked into Burke Lake in 1966 and have been stocked annually at a rate of 2/acre. Stocked muskie tend to run about 6 inches on average. In 1997, a gigantic 49 and one quarter-inch muskie was caught in a trap net. Anglers have annually caught several citation size muskie. A citation size muskie is a minimum of either 40 inches or 15 pounds. The largest muskie caught at Burke Lake was a 26.5-pound trophy in 1985. Muskie can be caught with large buck tail spinners and crank baits by casting in late fall to early spring. Burke Lake normally stratifies (by temperature layers) in late spring. The thermocline is established about 10 feet down, and muskie tend to hang just above this layer. Anglers have success trolling large crankbaits and buck tails from late spring to fall, targeting the muskie hovering above the thermocline in the cooler water that still has sufficient dissolved oxygen. Anglers should target points and vegetated flats early in the year before trolling near creek channels and break lines as the year progresses. Burke Lake walleye were initially stocked in 1979 to provide a diversified fishery. Walleye have been stocked in numerous lakes, as these excellent eating fish have become a prized game fish by many anglers. However, walleye are stocked annually at a rate of 100/acre to maintain an acceptable fishery. The average size of stocked walleye runs about 1-1.5 inches and can quickly grow to 9 inches by the end of the first year post stocking. Burke Lake has produced large walleye over the years with some over nine pounds sampled by Department fisheries biologists. The largest walleye ever sampled was caught in a trap net and weighed 10 pounds. Anglers have consistently caught walleye in the 4-7-pound range over the last few years. The lake record walleye was an 8 lb. 12 oz. trophy caught in 1990. Anglers are encouraged to try trolling deep diving, fire tiger colored crank baits and spinner rigs around the lake off deep water break lines and points adjacent to deep water. Anglers should try a variety of soft plastic grubs on jig heads and slowly jig them over the bottom. Anglers should also remember that Burke Lake stratifies during the summer; walleye and most other fish stay above the thermocline (usually about 10 feet down) during this time. Serious walleye anglers can try fishing Burke Lake at night, when walleye actively feed. The Department ramp is open 24 hours a day to fishing and launching boats only. Burke Lake provides a good channel catfish fishery. The lake was initially stocked with channel catfish in 1964 and receives an annual stocking of 10/acre. The lake has produced numerous channel catfish in the 10-15-pound range. The lake record is a 21 lb. 8 oz. channel catfish caught in 1999. Anglers are encouraged to fish along the shore to find that perfect little hot spot. Burke Lake provides a decent bluegill fishery with an abundant population. Anglers have a high success rate in catching bluegill, but they tend to average only 5 to 7 inches. Electrofishing by Department biologists yielded high catch rates of small bluegill. No bluegill over 8 inches were collected in the 2010 sample. The bluegill population is suffering from the effects of living in an ecosystem with gizzard shad and white perch. The competition between these species usually leaves the bluegill small and slow growing. The average size bluegill harvested is about one-quarter pound. The lake has some large redear sunfish that might make up for the lack of size in bluegill. Redear sunfish will fall prey to the same baits fishermen use for bluegill. The lake record sunfish weighed 2 pounds, and a few redear sunfish over a pound have been caught recently. Burke Lake provides a decent black crappie fishery with numerous fish in the 6-8-inch range. Crappie tend to average on the small side, but the lake has produced fish in the 2-3 pound range with the lake record crappie being 3.5 pounds. Anglers are encouraged to try fishing small crappie jigs and tubes or jig heads tipped with small minnows around fish structure habitat or off the fishing piers. Anglers should not overlook effective lures like the Beetle Spin for catching Burke Lake crappie. There is a 12-inch minimum size limit on largemouth bass in Burke Lake. Anglers can harvest five bass per day as long as they are 12 inches or longer. Anglers are encouraged to practice catch and release on larger bass, as their value to the fishery can provide enjoyment for the many other anglers that fish the lake. There is a 30-inch minimum size limit on muskie in Burke Lake. Anglers can harvest 2 muskie per day if they so desire as long as they are 30 inches or longer. Anglers should take into account that the more carefully released legal size muskies, the better the chances will be to catch a trophy in the 20 to 25 pound range in the years to come. There is a (statewide) 18″ minimum size limit on walleye in Burke Lake. Anglers can harvest 5 walleye per day and are encouraged to do so, as they are excellent eating. There is no size limit on channel catfish in Burke Lake. Anglers can harvest 10 channel catfish per day. There is no size limit on sunfish (bluegill, redear sunfish, warmouth, etc.) in Burke Lake. Anglers can harvest 50 sunfish (combined) per day. Anglers are encouraged to harvest bluegill in hopes of thinning out the population to allow for increased growth rates and eventually larger bluegill. There is no minimum size limit on black crappie in Burke Lake. Anglers can harvest 25 black crappie per day. Camping, swimming, sailboats, wading, hunting, trotlines and fishing tournaments involving prizes are prohibited. Trapping by permit only.The use of kayaks in Burke Lake is prohibited unless the user is actively engaged in fishing. Boat anglers are permitted to use trolling motors on Burke Lake. Anglers with outboard motors on their boats can fish the lake as long as their motor is trimmed/propped up out of the water. The gas tank should be removed from the boat if at all possible or the gas line disconnected. Burke has numerous facilities for the angler anticipating the catch of a large fish or for the family looking for a great day together. There are two boat ramps that allow anglers access to the lake: VDGIF boat ramp is located at the back of a protected cove near the dam and is for angler use only. The other boat ramp is located in Burke Lake Park around the mid-lake region. Handicapped-accessible fishing piers are positioned near the dam and can be reached from the VDGIF boat ramp lot. The park has a large handicapped-accessible fishing pier, lighted for night fishing and usually provides good crappie fishing opportunities. The park concession has rental boats available, bait, tackle, snacks and beverages. There is unlimited bank fishing around the lake along with a jogging/bike trail, picnic and campgrounds, golf driving range, golf course and Frisbee golf. Anglers can access the lake through the Department ramp 24 hours a day at no charge. There is a $5 launch fee for boats at the park ramp along with a $8 entrance fee per vehicle on weekends for non-Fairfax County residents. Park users are reminded that Burke is a public fishing lake (not a “park” per se), and fishing is the only primary use. Lake activities interfering with fishing (e.g., remote control boats, dog training, paddle boats, sail boats) are prohibited. The access issue at the DGIF (State) access road on the south (dam) side of the lake seems to be improving since spring 2008. Lake and park users not engaged in fishing are becoming educated that the angler access area is not to be used for dog walking, jogging and other non-angling activities. Trespass summons have been issued, and most cases have gone to court and resulted in convictions. Kayaks, unless used for fishing, are prohibited in Burke Lake. Signs will soon be posted in this regard.